Migraines are difficult enough for adults, let alone children, and migraines at school? Well, that can be a problem that leaves children, parents, teachers, school nurses, school administrators, and other involved parties frustrated and often at a loss. Zero-tolerance policies about students having medications at school, the lack of knowledge and understanding on the part of the adults in charge, and the stigma associated with migraine all play their part in making school years miserable for students from preschool through college. Please follow the link to continue reading Migraines at School - Helpful Forms, Reducing Stigma, and More. 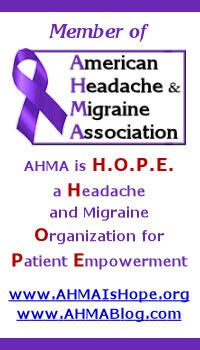 Join the AHMA now and become a part of this patient-focused, patient-driven organization which exists to EASE the burden of Migraine and other Headache disorders through Education, Awareness, Support, and Engagement. Go to www.EaseHeadacheMigraine.com.